Today I want to give the scientific explanation for something we all love to see (especially if, like me and Mrs Geek, you live in rainy Manchester) – the blue sky. I will also discuss the colour of the skies on the Moon and Mars, two faraway places where spacecraft have landed and taken photographs of their surfaces and skies. 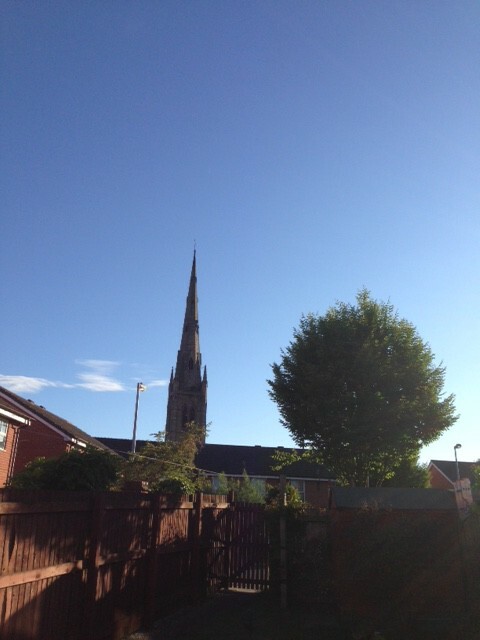 A very welcome blue sky over our back garden! You may remember from your high school science lessons that light is a form of electromagnetic wave. The diagram above shows a wave of light. The blue lines show the strength of the electric field. See note 1. The wavelength is the distance between successive peaks, marked as A in the diagram, or successive troughs, marked as B in the diagram. The wavelengths are so small that they are usually measured in nanometres (normally abbreviated to nm). 1 nm is equal to one billionth of a metre. The human eye is sensitive to light with wavelengths in the range of 380 nm to 750 nm and we see different wavelengths of light as different colours. Most sources of light, including that from the Sun, produce light waves with a mixture of different wavelengths. If the amounts of light at different wavelengths (or colours) are present in roughly equal proportions then the eye sees the mixture of colours as white. 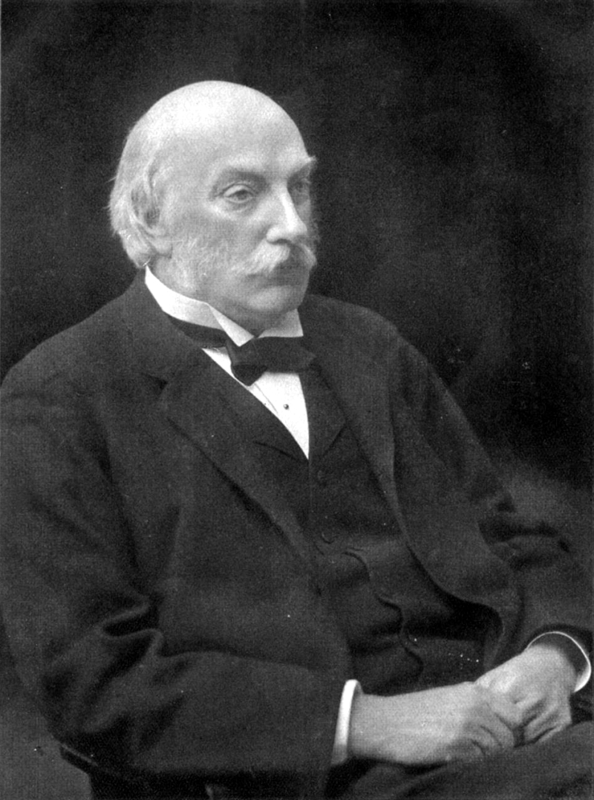 In the late nineteenth century the British physicist Lord Rayleigh (1842-1919) explained a phenomenon which is now called Rayleigh scattering. Rayleigh was able to show that when a beam of light, such as that from the Sun, passes through the air then a small amount of the light is scattered in all directions when it interacts with the individual molecules in the atmosphere. This is shown in the diagram below. See note 2. Firstly, the number of air molecules the beam of light encounters. The more air molecules or the greater amount of atmosphere which the light beam encounters, the greater the scattering. Secondly, the shorter the wavelength of the light the greater the scattering. So if we take a beam of light such as that from the Sun, which contains multiple colours, then the shorter wavelengths (violet, indigo and blue light) are scattered more than the longer wavelengths such as orange and red. This is shown in the graph below. This explains why the sky is blue. The blue sky we see is the blue light from the Sun which is re-emitted by the air molecules in all directions by Rayleigh scattering. One other thing that the diagram shows is that violet light has a shorter wavelength than blue and it is scattered even more. However, the Earth’s sky is not violet. This is because the strength of the Sun’s light isn’t the the same at all wavelengths. It contains relatively little violet light compared to blue. So, although violet light is scattered more in percentage terms than blue light, there is less violet light to scatter. One other effect of scattering is that it makes the colour of the Sun to an observer on Earth appear to be yellow-orange, rather than white. Although the balance of the colours is such that the Sun’s light is white as it leaves the Sun’s surface, when it encounters the atmosphere scattering removes from direct sunlight a greater amount of the shorter wavelengths (violet, blue and green) than the longer wavelengths (yellow, orange and red) and the resulting mix of colours appears to be yellow rather than white. Interestingly, when astronauts view the Sun from space well above the Earth’s atmosphere it appears to be white. Near sunrise and sunset, when the Sun is at a low angle in the sky, just above the horizon, the Sun’s rays have to pass through many hundred of kms of atmosphere before hitting the Earth’s surface. Because the Sun’s rays pass through much more atmosphere, the degree of scattering is much greater than when the Sun is higher in the sky at midday. As shown in the table below, virtually all the shorter and medium wavelengths of light, (blue, green and yellow coloured light) are removed from the Sun’s rays, leaving only the longer wavelengths (orange and red). This explains why the Sun appears red near sunrise and sunset. The Moon has no atmosphere. Therefore there is no Rayleigh scattering of sunlight and the sky appears completely black during the day. The Sun appears to be whiter and slightly brighter than it does on Earth because the shorter wavelengths are not removed from direct sunlight as they are on Earth. One interesting effect of having no atmosphere is that the Apollo astronauts who walked on the Moon found it very difficult to judge how far away objects were. On Earth, the atmosphere causes distant objects look slightly hazy, but this is not the case on the Moon. For example, astronauts were unable to estimate whether a hill was a small 100m hillock only 1 km away or a 2 km mountain 20 km away. Mars has a very thin atmosphere. The air pressure on Mars is only 0.7% of that on Earth. There is far too little atmosphere for Rayleigh scattering to be an important effect. Indeed before the first space probes landed on Mars back in 1976 many space scientists expected that the sky on Mars would be black. In fact the sky on Mars is a pale reddish brown colour. This is due to small particles of reddish brown iron oxide dust suspended in the Martian atmosphere. Light also has a magnetic field which is always at right angles to the electric field. To simplify the diagram this is not drawn. Thanks for the cogent and clear explanation. This is something that I always feel like I understand, but when I’m pressed to put it in words, I realize I can’t thoroughly explain it! And Mars’ sky color – very interesting. Very interesting! Thank you! Especially the part about depth perception on the moon. It makes total sense. Thank you for your comment. The other difficulty with estimating distances to objects on the Moon,were that there are no visual clues such as: the sizes of natural objects e.g trees, animals etc or man made objects e.g. motor vehicles, to allow the astronauts to estimate the distances to objects outside their immediate vicinity. I am like gregole – I feel like I understand but have difficulty explaining well. Good explanation, and pleased to hear that the sky is blue even in Manchester – sometimes! fascinating! I’d heard why it was blue before but never thought why it turned red at sunset. In depth and well researched post. It brought back memories of Physics class in school. Great post! Now the question is, why do we find it so beautiful? Very interesting of things I take for granted. So why do stars always appear white no matter their elevation in the sky? I am glad you enjoyed the post. The reason why stars appear white is that at very low levels of light, such as those found in the night sky, the human eye is not able to distinguish colour. Also, in conjunction with what the author has said, stars DO have colors. You can determine subtle differences between red-orange stars (like Betelgeuse, for example) with blue stars, e.g., Rigel or Vega. And even a basic camera can capture these differences with a long-exposure shot. Great, but what’s the version you tell a 5-year-old? A really interesting point. I think there is a definitely a need for a Understanding Science for 5 year olds blog.